Haitian team recognized for fighting for food democracy by promoting safe, healthy agricultural practices and advocating for peasant farmer rights. The US Food Sovereignty Alliance announced Aug. 13 that a team of Haiti’s five largest peasant organizations won the fifth-annual Food Sovereignty Prize, an honor granted to grassroots groups for creating projects that create “food democracy” and combat hunger and poverty. Food democracy refers to “bottom-up, communal and cultural approaches to deal with hunger and poverty,” according to Charity Hicks of the Detroit Food Justice Task Force, a group that sponsors the prize. 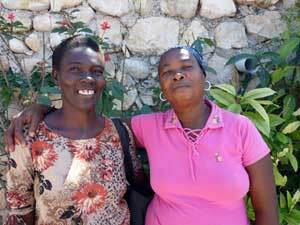 Selected from 40 applicants, Haiti’s winning team represents more than a quarter million Haitians and fights for food democracy by promoting safe, healthy agricultural practices and advocating for peasant farmer rights. PORT-AU-PRINCE, Feb 26 2013 (IPS) – Angry and frustrated, but also cautiously hopeful, victims, human rights advocates and the Haitian population are waiting for Thursday, Feb. 28, the day former dictator Jean-Claude “Baby Doc” Duvalier has been ordered to appear at a hearing to determine whether or not he will face charges for human rights abuses committed during his brutal 15-year regime (1971-1986). Thousands of protestors rally against increased cost of living. PORT-AU-PRINCE, Apr 24, 2012 (IPS/Other Worlds) – In honour of Earth Day, we run an interview with Yves-André Wainright, who discusses ways that poor governance and the role of foreign donors have contributed to the country’s environmental catastrophe. He also lays out a blueprint for what could turn the situation around, effectively mobilising both government and the population to begin restoring the environment. Yves-André Wainright served twice as Haiti’s minister of environment. Trained as an agronomist, Yves-André’s work has focused on environmental management, especially management of natural resources and waste. 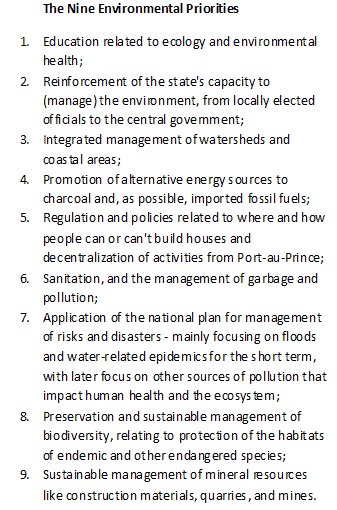 My approach towards management of the environment is to have Haitians who face (the same environmental) challenges come together. We might not all share the same economic interests, but if we work together, we can reach a compromise where one’s interest won’t trump another’s.